As you may know, from Monday, the 8th Of April, TfL and Mayor Sadiq Khan launch the ULEZ charge. The zone will be covered by the existing Congestion Charge (CC) area in Centra London, which the Mayors hopes will shortly (25/10/2021) be followed by an expansion to the North and South Circular. TfL have publish their ULEZ car finder, which is supposed to let you know if your vehicle will have to pay the charge. 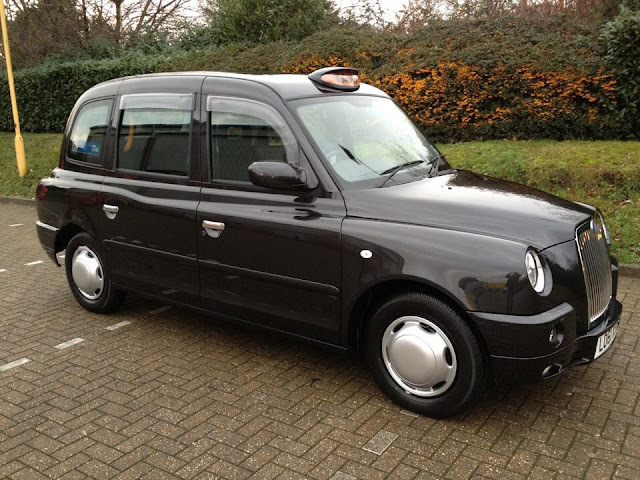 As an experiment and to see how accurate the ULEZ checker is, we added the number of a 61 plate TX4 Taxi. You are subject to the ULEZ. From 8 April 2019 if you travel in the ULEZ you will need to pay the daily ULEZ charge. This is because your vehicle does not meet the ULEZ standards. So there it is...it’s a full exemption (not a discount) for all plated Taxis. 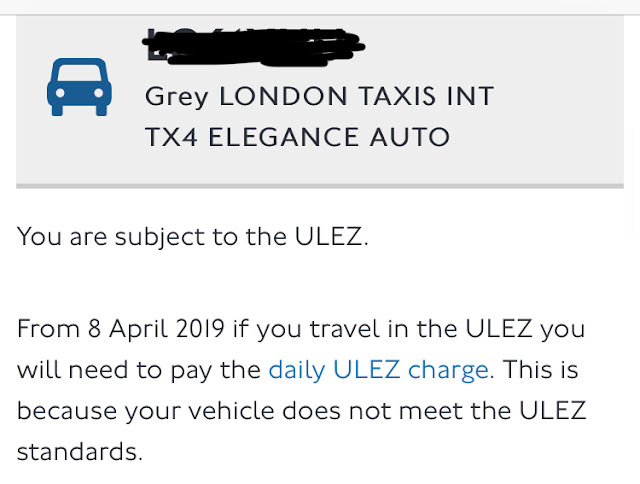 Remember though, if you plate has expired and you need to enter the ULEZ zone to reach a test centre from your garage, you will have to pay the charge. But again we see just how incompetent TfL are at actually putting accurate details on their Website or online Twitter account. 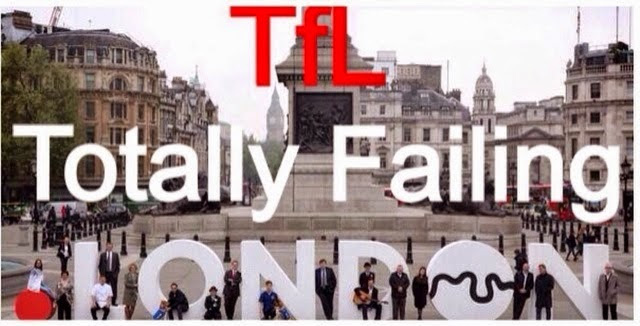 If TfL were a commercial company l, certain people working there would be looking for a new job. Keepers of vehicles registered with a 'disabled' or 'disabled passenger vehicles' tax class will benefit from a sunset period after the ULEZ starts. They'll be exempt from the ULEZ charge until 26 October 2025 as long as their vehicle doesn't change tax class. Blue Badge holders will need to pay the charge from 8 April 2019 unless their vehicle meets the new ULEZ emission standards... or is registered with the DVLA with a 'disabled' or 'disabled passenger vehicle' tax class. So again we see TfL discriminating against the disabled. Not only are they being stopped from utilising a door to door Taxi service, as fully wheelchair accessible Taxis are banned from certain streets and bus lanes, they will soon (2025) have to pay the ULEZ charge even if their own vehicle is a registered disabled Tax class. Former Mayor Ken Livingstone had the philosophy ‘before you can charge for congestion, you have to create congestion. That’s exactly what he did in the run up to the introduction of the Congestion Charge. He told utility companies that for 6 months after the introduction of the Congestion Charge, they would be no permission for Road works other than emergencies. So the utilities rushed through as many programs as they could, right up to the introduction date. When the charge came into effect, the Road works disappeared and Jen shouted from the roof tops ‘look, my new CC charge is working, traffic is moving much better now’. Now TfL and Sadiq have taken a leaf out of Ken’s book. Traffic lights have been phased to stay on red longer, road companies have been given permission to store plant equipment on central London streets causing chaos. All this traffic congestion results in higher pollution. There are road works on Conduit Street junction of New Bond Street, with a 4-way alternate lane traffic light system, causing major traffic congestion. Around 10pm, someone (won’t say who) unplugged the lights and within 5 minutes, the traffic congestion disappeared. Plant has been left for months untouched on the streets, holes dug and work crews disappear for weeks at a time. London looks like one massive building sight. It will be nice when it’s all finished...that’s what they told us 20 years ago and there doesn’t look to be a finish date in sight. Are Sadiq and TfL actually willing to kill members of the public just to raise money ?????? The increase in traffic congestion and therefore higher pollution levels are contrived by the Mayor and TfL as a cash cow. If we are to believe the propaganda constantly spewed our by the Mayor about London’s Toxic air killing people, then it is he and TfL who should be shouldering the blame. And just to think that everyone thought David Copperfield & Houdini were great illusionists. I’ve heard of pulling the wool over peoples eyes but this mob have sheared the whole flock & draped the it over the publics pupils!!! It does'nt really matter if the ULEZ registration checker says one thing but TFL exempts paying on another page as long as we are exempted, This only shows our vehicles information stored or recognised seperately from the general public. Bearing the above in mind, It should be remembered the importance of every cab driver who does not own a Euro 6 or electric Cab to complete the unjust TFL consultation regarding reducing the taxi age limits from 15 years to 12 years remembering not only has the current 15 year age limit taken a considerable effect in reducing the taxi stock in london as has the current delicensing scheme which will make numbers unacceptably short. On other Consultations TFL has conducted such as bus route changes etc the response levels have been quite low 1800 ish yet has caused reconsideration or re-evaluations by to be considered especially concerning disabled passengers who will be deprived the regular or continual service everyone else currently receives and are therefore being treated poorer. It matters to state every reason not to reduce the age limits again especially concerning the state of the trade on current business and techology supply limitations and how more time is needed to relate to these issues remembering that it is TFL's intent to play this consultation game again next year so make our case heard and the comparable numbers of dissent high with their other scrapped or changed consultations and making it clear how our contributions to clean air strategies have been long and are permanently ongoing with the technology TFL has continually approved as acceptable at our expense and reducing age limits any further will only show incompetance on their previous decisions of acceptabilities which we all fell for.